The vineyards of Crozes Hermitage surround the hill of Hermitage and so are subject to similar climatic conditions, though they do not rise as high, nor are they on the steepest slopes. 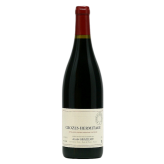 The difference between the wines of Crozes Hermitage and Hermitage can be mainly attributed to the soil. As you come down the Hermitage slopes the soil profile changes from hard granite rock to denser, sandier, clay rich soils. Alain Graillot has been producing wines reflecting his integrity and high standards since 1985. Born in the Northern Rhône, he left to pursue a career in business, but returned home to his dream of creating great wines. Without the opportunity of stepping into an existing family winery, Alain undertook formal studies in Burgundy while seeking the guidance and inspiration of the best of the new generation of winemakers including Jacques Seysses of Domaine Dujac. He now has some 15 hectares in Crozes Hermitage itself as well as one hectare in St-Joseph. He matures his red wines in one year old french oak barrels from Burgundy.